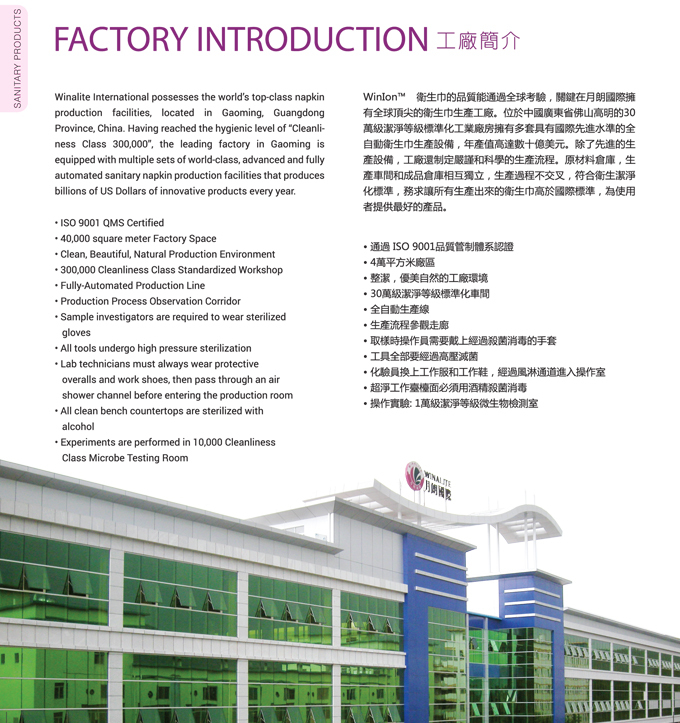 'WinIon' has the characteristics of extra powerful absorption and enhanced air ventilation to keep dry. 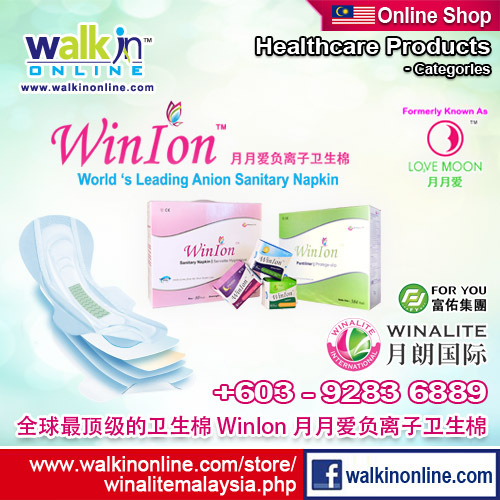 The high-tech anionic tape embedded within every single napkin is the most important distinction between 'WinIon' and other brands of sanitary napkin. The anionic tape in the product can emit high density of anions and achieve the anti-bacterial and deodorization functions for positive effects on the woman's health. 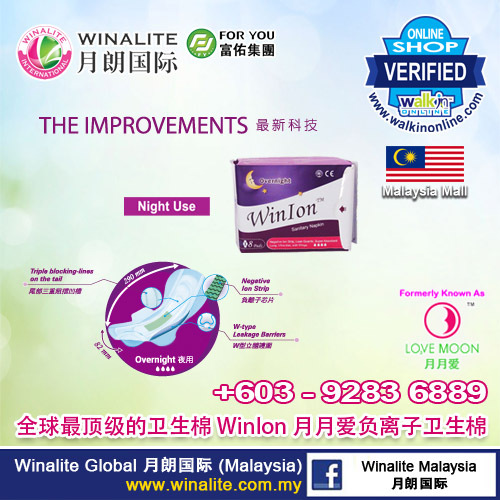 Apart from having the high-tech material, 'WinIon' has its main component designed for better care of the women's health. To keep the delicate skin of the woman dry during menstrual period, thin cotton materials for the napkin's surface are used. The extra powerful absorption layer can allow the liquid absorbed to coagulate immediately to prevent back flow and over flow to make possible free and comfortable movements. The porous lower layer allows water molecules in the gaseous state to pass through, reducing the uncomfortable feelings while using sanitary napkins. 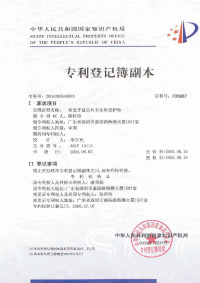 In addition, the "Vaginitis Self Test Kit", a pioneer healthcare product in the world that has also been awarded a national patent, is given free with the product for women to conduct tests on their own reproductive system for better assurance. "Dry, well ventilated, clean" are three principles for healthcare of female reproductive system and of these, cleanliness is the most important. 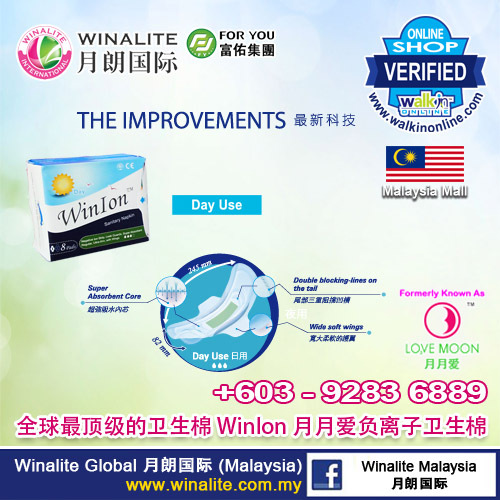 The production of 'WinIon' complies with the National Hygienic Standard of GB15979-2002 with strict control over the raw materials and their hygienic standards. 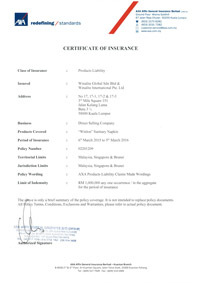 To ensure no contamination in the production process, 'Love Moon' is produced using enclosed production plant of international advanced standard with fully automated sequential processing and packaging. 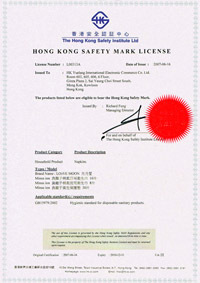 To ensure that the products are free from bacterial and fungal contamination, all ex-factory products are packed in sealed packets with easy to open design. 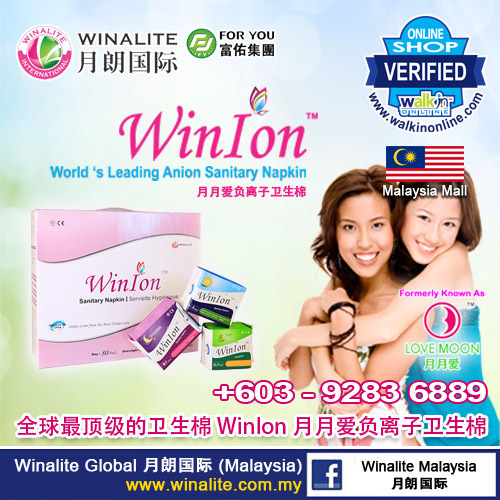 'WinIon' cares for woman's health through technology to benefit all women in the world. 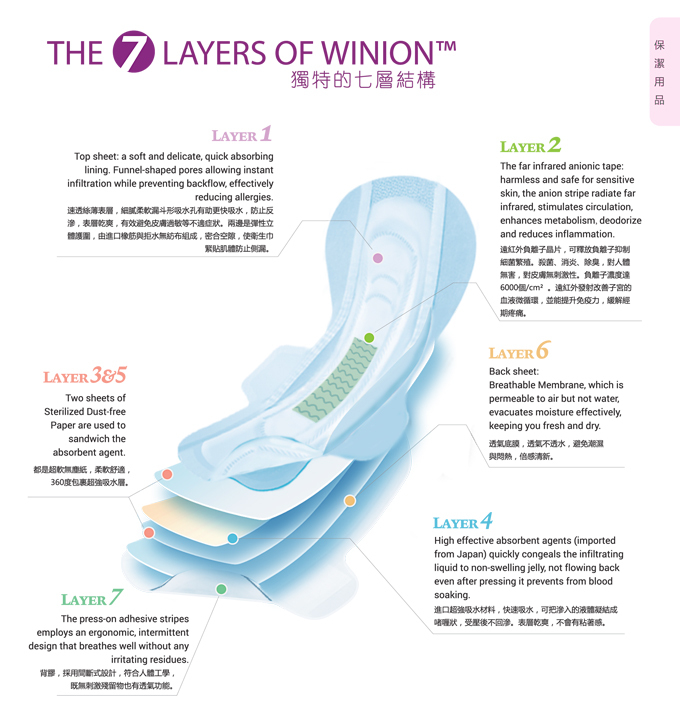 WinIon sanitary napkin has three main components: the surface layer, the absorbent layer and the base layer. The surface layer is made of thin silk and soft cotton materials to keep the delicate skin dry and comfortable. The middle layer contains highly effective super strong absorbent agents that can turn the liquid discharge into a jelly-like state to eliminate the sticky feeling. The base layer is made of air permeable materials that allow diffusion of water molecules in the gaseous state to rapidly drive away moist air, thus effectively reducing moisture and heat between the napkin and the skin to maintain a dry and comfortable feeling. The padding in each napkin is embedded with an anion tape that can release high density anion to help regulate body functions,such as antibacterial capabilities, deodorization, through purely physical processes. There is no side effect. 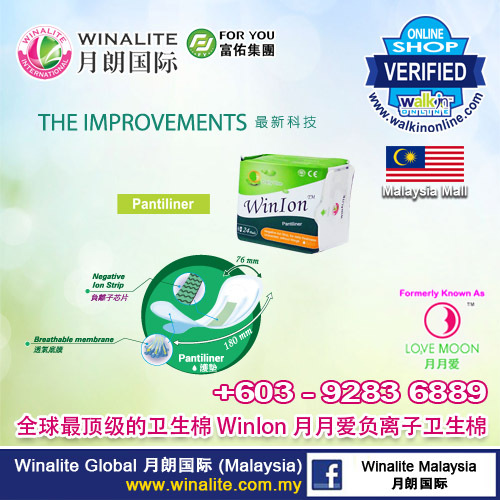 WinIon sanitary napkin has an absorbent layer. This is made of highly effective and super strong absorption agents as well as leak-proof materials through a special high-tech process. When the liquid discharge comes into contact with the layer, it is absorbed such that there is no backflow or leakage. This will ensure a comfortable feeling and convenience in movement. 'Keeping dry, air permeability and cleanliness' are three main principles of genital care. 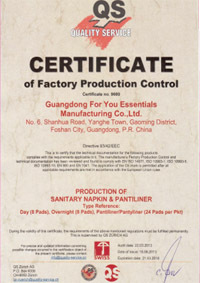 Production of healthcare sanitary products must strictly comply with the GB15979-2002 hygiene standard.